Israel because he “had striven with God and with humans, and had prevailed”. The liturgical calendar is made up of all of the “major” seasons of the church year – and “ordinary time.” It is the stretch between Pentecost and Advent, with a few special Sundays sprinkled in here and there. And the early church leaders structured this “ordinary time” as a time for studying key stories and lessons in the scriptures. It is the “green growing season,” a time for learning new things, thinking new thoughts, examining old understandings. It’s prolonged…with lots of room for wandering through our beliefs and our faith. And so this week, we found ourselves swimming around in continued contemplation about “expectation.” Do our Expectations shape outcomes? What happens when we give up Expectation? Are we disappointed? Surprised? At peace? It seems that we seek patterns and assign expectation based on what we’ve seen happen in similar situations. We don’t just have expectations for ourselves. We have them for those around us, and sometimes, even though they are unspoken, we somehow Expect others to know what we want of them. And to add another layer of difficulty, those around us have their own unspoken expectations of us they expect we will fulfill! It is amazing we stay in relationship at all sometimes! The text from Genesis follows Jacob as he returns to his kin. Remember that Jacob has had a vision and has heard God promise him the land that he had seen. Now he has continued on the journey, seeking out his mother’s brother, Laban. He first finds Laban’s daughter, Rachel, keeping Laban’s flock. Both Rachel and Laban greet Jacob with enthusiasm. Kinship means a lot in this ancient culture. Of course, we can’t overlook the fact that Jacob finds Rachel attractive. Leah is described across various versions as “lovely,” “weak,” or “soft,” while Rachel is described as graceful and beautiful. The description is similar to that of Sarai and of Rebekah. The selected text from Paul’s letter to the church at Rome has a couple of oft-quoted nuggets built into it. It’s good stuff. Essentially, Paul asserts that God knows the goodness in a person and is responsive to that goodness through the work of the Spirit. It is God’s understanding of our individual human nature that enables the Spirit to be present for us. And if all of this good is working behind the scenes, what can happen that is not God’s doing? So…we have expectations and they aren’t met. Is that God’s doing? And for what reason? It doesn’t seem like it can all really be for good, can it? Life for us has been a puzzling series of events, of forks in the road where neither path seemed to be the right one. And yet, we keep moving and we keep developing a sense of who we are and what we are called to do in this place. Our Expectations have been shattered, met, or exceeded by turn. And life goes on. -How do you / we allow for our life working out in ways we do not expect? -Are there ways you have had to wait for “the answer” to be revealed to you (like Jacob, or the farmer, or the baker)? -Are you committed to God’s conclusions, or are you committed to your own? Sometimes, we speak in terms of Expectations being met or of Expectations being dashed. But really, are our Expectations ever just “tested?” Are Expectations anything more than our own? Aren’t they interpretations through our own context of cues and clues and markers? And what are “Expectations” anyway? Some would define an Expectation as something you anticipate (good or bad) that will occur in the future. One of our Buddhist friends says “Expectations are preplanned disappointments.” Usually though, when any of us have an Expectation of some thing or some one we have some knowledge and some reason to believe that some event (or series of events) will occur in the future. It seems that Expectations are born when we look at our past and current experiences and try to project what might happen tomorrow. We take our understandings of things past and apply them forward to how we Expect things / people / systems to work in the future. But unfortunately we can never control all of the circumstances and assure how things will work out. We often approach Holy Week through a lens of Expectation. Beginning with the high energy of Palm Sunday, we walk through the changing sea of faces in Jerusalem as the popular tide turns and a frenzy builds around Jesus and his ministry. In our own high moments of life, our Expectations about personal achievement and ability can cloud our view of what is best not for us but for the world. The lectionary this week examines some different Expectations – specifically Expectations about the Kingdom of God. In Genesis, Jacob rests his head on a stone to sleep, weary from his travels. In the night, he has a vision. In the vision, the Lord is showing him the land before him, promising that this land will belong to him and his offspring. The Lord promises to be with Jacob until the Lord has done what has been promised. (Hmm…speaking of Expectation, do we ever want to Expect God NOT to be with us?) In recognition of this important vision and promise, Jacob sets a stone in this place, consecrating it with oil, naming the place Bethel (God’s House). In our heads, we sort of imagine that Jacob received this vision with elation – not dread of what it would take to get there or whether the Lord would really always be with him. The Psalmist talks a little about Expectations he might have for God and Expectations God might have dreamed for the writer. He writes about what he believes to be the nature of God. He works with his culture’s Expectation that God is a combination of ever-present and all-knowing. He dreams of what the creation process looked like for him in particular and how it works for the world in general. The writer of this Psalm paints a picture of the world according to how he understands the nature of God and how he envisions…or Expects the world to work. In Paul’s letter to the Christians in Rome, we see him working with some fairly blatant Expectations. As we have seen prior to this passage he has a definite vision of the purpose of the Law and the purpose of the Spirit and how each of us as Children of God are to interact with the Law and the Spirit and how each of us are to benefit from the Law and the Spirit. He has some clear Expectations of what each individual believer’s responsibilities are and how those responsibilities relate to how the creation will resolve itself. Ask yourself if your Expectations meet Paul’s. In the Matthew passage, we are introduced to another parable. Jesus is still using a plant metaphor, but this one seems more ominous. He talks about careful planting that is invaded at night by the enemy, who plants weed seeds amidst the good seed. In consideration of the good seed in the field, the Master does not destroy the plants in the field, but lets the good seed grow up beside the weeds, then calls the harvesters to remove the weeds – to be burned – and then to harvest the good grain. Jesus spares no explanation – it is just as it will be at the end of the age, “the good seed are the children of the kingdom; the weeds are the children of the evil one.” Yikes. The Bible is a framework on which we attempt to hang our Expectations. In the process, we may alter our understanding or the very meaning of the words that were passed along in these sacred texts. Do we xpect God to be always present? Do we Expect God to destroy weeds and only harvest the “good?” Do we Expect to be free from sin? Do you have Expectations of God? Does God have Expectations of you? Do you have Expectations of yourself? Do you have Expectations of your community? Does your Community of Expectations of you? "Who All Has a Part?" Ministers, in my experience, aren't a particular brave lot. The job seems to attract people who place a high value on harmony, and who are seriously addicted to being liked. But the Metro section of today's Washington Post quoted Rev. G. Randolph Gurley, the pastor of the Tabernacle Church in Laurel, and the man is clearly exceptional. At the funeral yesterday for Ronnie White, the man who was killed in a police cell in DC last week after being arrested in connection to the death of a police officer. Not surprisingly, White's case has generated great deal of anger towards the police. At the funeral, however, Rev. Gurley was clear that there were more people to blame for White's death than just the person who strangled him. "When did it all start? Who all has a part in this tragedy?" Gurley asked, gazing intently into the eyes of several people in the pews before him. "We all know someone took his life, but it goes beyond that. We know that Ronnie didn't wake up that day and say, 'Today I'll participate in some activity that will result in someone's life being lost and later lead to the loss of my life.' His family, his friends, the school system, certainly the faith community . . . maybe we all have a part in this." Now that's preaching. Don't get me wrong--whoever killed White should be prosecuted for murder, and I have no doubt they will be. But in the face of clear and righteous anger, it takes guts to challenge people to not just look for an enemy, but to look within themselves. It might be hard to assert that you can both hold individuals accountable for their actions AND acknowledge the collective responsibility we have for each other. But it's true. What if we all asked Rev. Gurley's question--not just at the funerals of those who have died premature, violent deaths, but every time we complain about a social or community problem. What if we asked that question before we prayed about war or violence or poverty or ignorance? Who all has a part in this tragedy? We all do, plain and simple. We are all a part of one another, and I'm glad there are churches which keep this truth at the center of their witness. 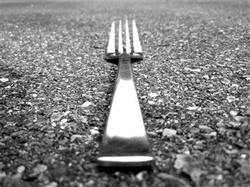 It’s hard to know from day to day or from one chapter of life to the next which way to turn at “forks in the road.” And life is full of them. We sometimes find ourselves wracked with uncertainty about which choice is “right” and which choice is “wrong.” We judge ourselves. And we sometimes use our context to determine the “rightness” or “wrongness” of the choices others make. Really, we’ve all made bad choices…but are any of them without some purpose in our lives? Throughout this season of “Ordinary Time,” it’s difficult to tie the lectionary together in a tidy package. This week is no exception. But we do see some common themes (thanks in part to the work of the Family Worship Team). Starting with the Hebrew scripture account of Jacob and Esau, we wonder about the place our choices have in the Kingdom of God. It takes Abraham’s son, Isaac, and his wife Rebekah a while to conceive the next generation. And when they finally do, twins are in their future. These twins wrestle mightily in Rebekah’s womb, and like any weary pregnant woman would, she petitions her God asking why she’s subject to this trauma. And the Lord’s answer isn’t very comforting…two nations in her womb, one stronger than the other, and the youngest ruling the eldest. We expect sibling rivalry, but to have it revealed prior to birth in such a dramatic way! Go ahead and read the entire account in Genesis 25. First, it’s great writing with all sorts of plays on words and built in humor. When the boys arrive, they are indeed very different. One is hairy and red! The youngest is clinging to the firstborn’s heel as they leave the womb. Our selection for this week ends with Esau (the firstborn) trading his birthright for some red lentil stew to his kid-brother Jacob. Sure, hunger is a driving thing sometimes, but give up his birthright? Birthright was everything in this ancient society…it was future economic stability, it was status in the community, it was power and might. And Esau was powerfully hungry. We’re with Jacob and Esau for a couple of weeks now. We’ll get to see how this plays out in weeks to come (but we won’t hold you to task if you plow ahead to read the exciting twists and turns in this story). In his letter to the church at Rome, Paul continues to struggle with his own history and the good news that he has claimed after his conversion. Paul was a good Jewish man. He was beyond obedient to the law – he was steeped in it. It guided his life. And in Jesus Christ, he’s found new law (notice the language – he clings to the language of “law”…even the Law of Grace). In his new life, free will creates a tension between God’s law and sin. And deep down, he knows that whatever his choice, he is a precious child of God – forgiven, but challenged to live a better way. In the gospel reading, Jesus is passing on the first of his parables. Read the entire passage (13: 1 – 23) for insight about the parables as a teaching tool and the disciples’ relationship to those parables. In this first instance, we have the benefit of Jesus’ own commentary about the parable told. A sower sows seeds on different kinds of ground. It seems as if they only beneficial planting is in “good soil.” But what about the other plantings? One feeds the birds. Another produces plants that have to contribute to the carbon exchange, right? Is only one outcome good, right, and productive? The psalmist gives thanks for God’s guidance and petitions the Lord for the strength and ability to hold to the law. This psalm is a gentle reminder that boundaries are something we might actually consider being grateful for…not a common thought in this day and age. So as we look back over our life and the myriad choices made, certainly there are some that were just plain bad. But we wouldn’t be the people we are in the places we are with the relationships we have and the gifts we have without those decisions. It’s not just that good decisions add to us and bad decisions take away from us. All kinds of choices and decisions leave their mark. On us and on God’s creation. • Are their choices that you’ve looked back on with regret? Pride? • Has your assessment of the choices that you have made changed over time? How? • What is different about your life because of the choices you have made? • How was God with you in your choices? In spite of your choices? • What guidance do you offer people facing choices? Sometimes, the lectionary gives us a mild headache. Some weeks, you can read all of the readings and emerge with nothing but knitted eyebrows. It’s one of those reading weeks where the Supreme Council of the Lectionary (in all seriousness, check out http://divinity.library.vanderbilt.edu/lectionary/FAQ/faq_lect.htm to find out a little more about who and how and why the lectionary gets to be) might have just rolled the dice and selected a few random passages connected by some common words in a single Psalm.